Homemade chili cooked in the slow-cooker, made with both ground beef, ground pork, beans, and chili seasoning from scratch. When it’s cool outside, a nice big bowl of chili is so wonderful. We never really had chili when I was growing up because my mom doesn’t eat anything that comes from a cow. I started eating chili more in college because my aunt made it often enough that I got her recipe from her. Then, I had it at Justin’s parent’s house and got my mother-in-law’s recipe as well. The first time I went to make it, I didn’t even pay attention and got ingredients for both recipes mixed up. I called my mother-in-law to ask her if I needed to also brown the ground pork and she had no idea what I was talking about. I looked closer at the recipes and realized that I had gotten ingredients from both lists. So I made the best of it and combined the recipes to come up with my own chili recipe. I used to use a store-bought chili seasoning, but decided to make my own one time and liked how it tasted better. The first time I did this was from necessity: I had forgotten the chili seasoning packet. I also wasn’t sure about adding sugar to the seasoning, but trust me, it makes a big difference! 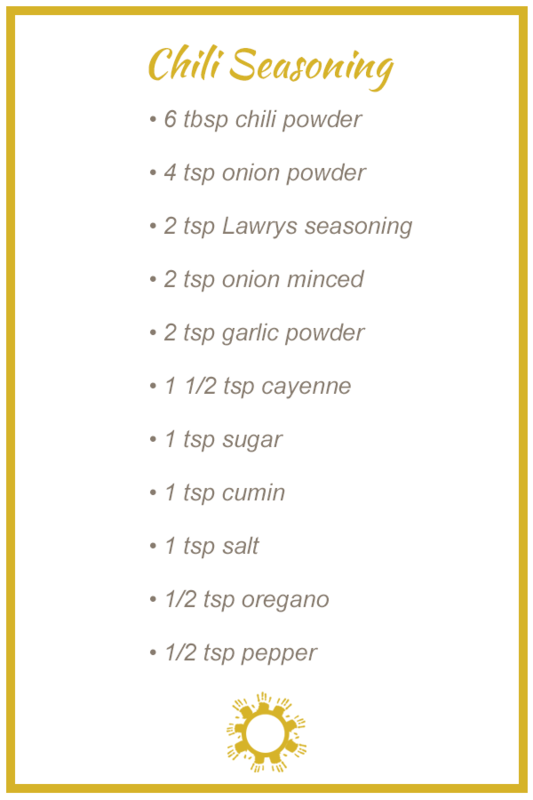 Of course, if you don’t have the time or desire to make your own seasoning, the packets near all of the seasoning and gravy mixes in the grocery store works well, too. I keep a lot of herbs and spices in my kitchen, so everything on the list is a staple in my pantry. I like to put some cheddar cheese on my chili, and sometimes top it with some sour cream to add a bit more flavor. This can also help mellow the flavor if you have a little too much of the spices. Also, bread or saltine crackers tend to go really well with a bowl of chili. In a large skillet, over medium-high heat, brown the ground beef and ground pork together. Meanwhile, add all of the other ingredients to the slow cooker, including everything for the seasoning. Give it a quick stir. Drain the meat and add it to the slow cooker as well. Stir until everything is well combined. Seeing your chili, now makes me want to make some chili to for the cold weather here. Yes, it’s so perfect for the cold weather! I love chili and make it often but I have never made beef and pork chili. I will try and maybe I will share it on my blog and will give you all the credits. I didn’t originally plan it that way, it happened by accident. But we loved it so much we continued to make it with both. Wuh! love it. Thank you for sharing the recipe. I always try something different on weekend and this would be wonderful recipe to try and enjoy. I love making this on the weekends. Brown the meat in the morning, throw it all in the slow cooker, and you have a delicious dinner ready by the evening! I have never made chili with pork before and so this is interesting. I would love to try it! I don’t even remember which recipe used pork and which used beef, but we liked it with both so kept making it that way! I love the flavor of both the pork and beef together. It’s yummy and makes it a little different. Chili is one of my favorite cold-weather meals! The seasoning is so good. I sometimes make a large batch and keep it in the pantry for other recipes that call for chili seasoning. Oh this chili looks so delicious! I would love to try this for my family. They will love it. I hope you get a chance to make this and you all enjoy! I never thought to put beef and pork in my chili, oh my! This looks better than what I have always ate for years with chili! I am definitely going to have to try this chili out! How delicious, thank you for sharing. I’ve never seen it anywhere else either. It happened on accident and we got lucky it was good! Yummm I absolutely love chili and this recipe looks so delicious! Definitely saving. Thank you! I hope you get a chance to try it for yourself. It’s so easy since it’s in the slow cooker. Yummy I haven’t had chili in so long!! I love mine with cheese and sour cream on top!! I don’t think I’ve made it since I did it for the blog. With how cold it’s been, I am planning to make it later this week again! This Beef and Pork Chili looks so delicious. I really need to try this recipe for my family and friends. Thank you! It makes a lot so it’s a great meal to share with a bunch of people. Oh my gosh! That looks so good. I just never can do chili because of how spicy it is!!! I can’t do many spicy foods either. You can adjust the recipe to put in a bit less chili powder and it isn’t quite as spicy. I will definitely be trying this one. My husband LOVES chili!